Euro NCAP has crash tested some of Europe’s best-selling business and family vans using protocols that are more true-to-life than the current legal tests for these van-based vehicles. The safety organisation is calling on manufacturers to offer these vehicles with higher levels of safety equipment and for legislators to review their lenient legal safety requirements. In the tests, the Ford Transit Custom was the only vehicle to score five stars. The Hyundai H1 scored three stars. The Fiat Scudo also scored three stars while the Renault Trafic scored two stars. Some of these vehicles are also rebadged and sold by other manufacturers. The Fiat Scudo is available as the Peugeot Expert and Citroën Jumpy. The Renault Trafic also sells as the Vauxhall/Opel Vivaro and Nissan Primastar. This time around Euro NCAP has focused on van variants that offer 8 to 9 seats. These vehicles are often used for business or considered by families as alternatives to large MPVs. Being derived from commercial van platforms, these people-carriers are updated less regularly and are generally less equipped for safety than normal passenger cars. If you have a family with a lot of kids and are tempted to buy such a vehicle, please be aware that they often do not offer the latest state of the art in vehicle safety. Some manufacturers are responding to Euro NCAP’s call and have committed to better equip light commercial vehicles when sold as family cars. The Ford Transit Custom, designed with Euro NCAP’s protocol in mind, features amongst other items curtain airbags that improve protection in the severe pole side impact test. The vehicle also received recognition in Euro NCAP’s Advanced rewards scheme for offering Lane Keep Assist, an important accident prevention technology, as an option to customers. 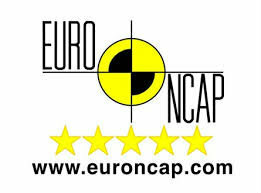 Fiat has also responded to Euro NCAP’s assessment. The manufacturer is making safety features such as the front passenger airbag and a Speed Limitation Device standard in more European markets. The Scudo’s Peugeot and Citroën sister models are doing the same. The protocols used by Euro NCAP to test family and business vans are slightly adapted from those used for passenger cars. The car safety organisation has designed its protocol to encourage greater fitment of safety equipment and to promote all-round protection to car occupants and other road users. 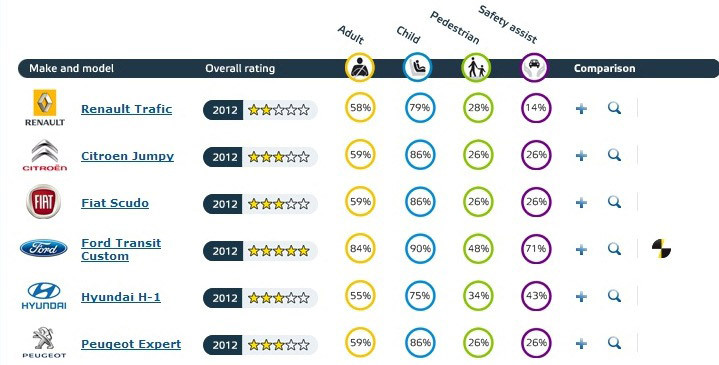 Below you can see the results of some of the vans that were tested in 2012. For a 5 Star service and value on your Van Insurance contact us at Insuremyvan and see how we can help you save money on your Van Insurance. As well as providing Van Insurance, we also provide great rates and cover for Fleet Insurance, Haulage Insurance and Public Liability Insurance.